Sun-Thurs, 11am-10pm; Fri and Sat, 11am-10:30pm. Major credit cards accepted. Enjoy fine authentic Mexican cuisine made from only the freshest ingredients and served hot with fast friendly service. Local bakery and café. Open 7 am - 7 pm. BBQ & ribs. Boston butts are hand-rubbed with signature 521 BBQ rub, and then smoked for 14 hours on the premises. Catering also. Lunch and dinner, Mon-Sat. Daily lunch specials plus Friday night 10 oz rib eye steak special. Mon-Sat, 6am-9pm. An authentic Asian fusion restaurant and sushi bar. Hibachi possesses all the qualities of a perfect dining experience. Enjoy the finest in steak and seafood skillfully prepared and presented with great flair by teppan-yaki chefs over an open flame tableside. Discover a new way to love Asian cuisine. We combine our expertise to create a fusion menu, offering high quality food selections prepared by master chefs from the Far East. Salads, a variety of seafood, hot foods, and desserts. 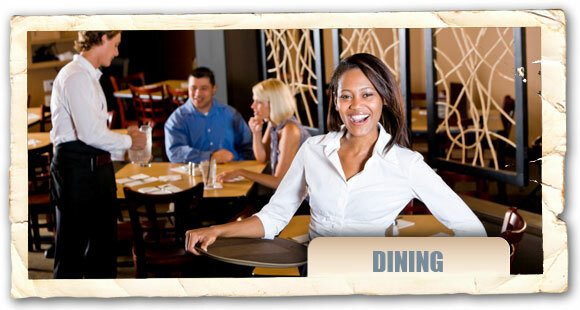 You are guaranteed a memorable dining experience with delicious foods and a fun time. Open for lunch and dinner, Mon-Sat. Galleria Mall area). Casual place for lunch or dinner (Mon-Fri) with daily specials. Beer & wine.